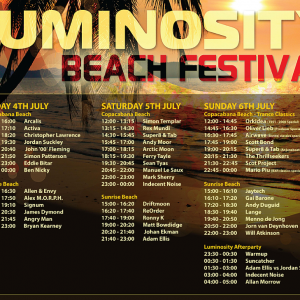 Luminosity Beach Festival 2015 – Timetable Announced! 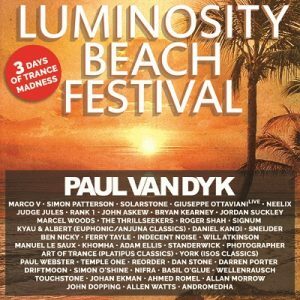 In two weeks the famous 3 day Trance madness will return on the most beautifull beach of Holland, bringing a little bit of magic from the Balearics to the Bloemendaal beach. Social media is buzzing, people are getting excited and the crew is working overtime. Only 2 weeks left and the annual madness will start again! 3 Days full of the best trance music. Are you ready for the biggest trance marathon of your life? ANNOUNCEMENT: New location for Luminosity Beach Festival After Party happening on Sunday the 28th of June 2015. 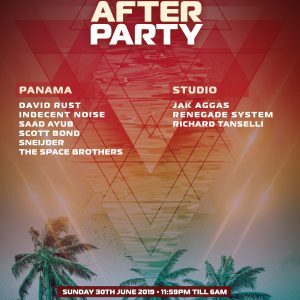 The after party was initially scheduled to be held at Club Stijl, Zandvoort, but due to its bankruptcy we have changed the venue to Club Panama, Amsterdam. 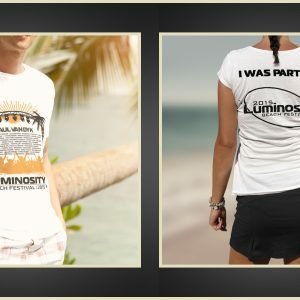 After learning of the bankruptcy, Luminosity Events were left with 2 choices, either cancel the after party or change the venue. 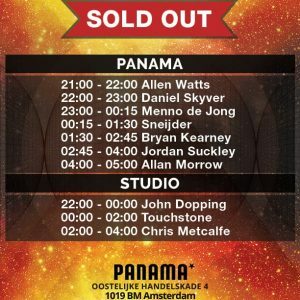 After searching alternative locations we thankfully found Club Panama – a class A venue that allows us to close this magical weekender in very similar intimate setting to Club Stijl but with the bonus of better sound system, location and facilities. LIKE & SHARE this announcement and we will select one lucky winner to receive your customized LBF15 t-shirt. You will be able to forward your own text on the t-shirt and we will organize that the shirt will be signed by your favorite artist. GO GO GO! 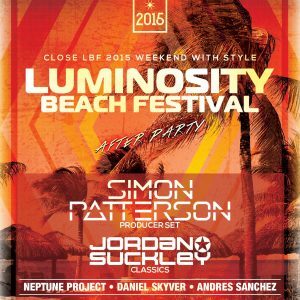 Luminosity Events is proud to present the Luminosity Beach Festival 2015 line-up! This October, Luminosity is proud to welcome two of the worlds biggest Trance superstars, coming together for the very first time at the award winning Luminosity headquarters: WesterUnie Amsterdam. 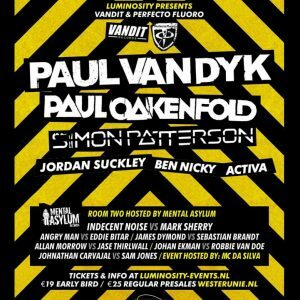 Luminosity will present the kings, the godfathers, the legends – PAUL VAN DYK & PAUL OAKENFOLD. 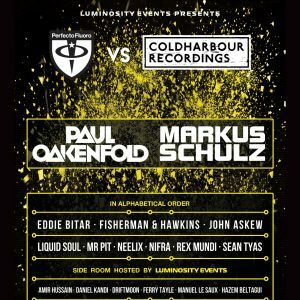 Celebrating Luminosity’s 7th birthday, and forming part of the huge Amsterdam Dance Event, everything is set for a very special Trance mega show. 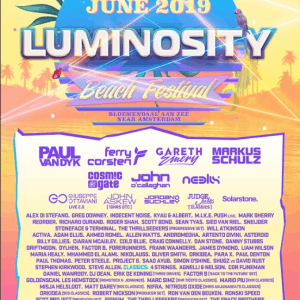 After a very successful first edition last summer, Luminosity invites Solarstone and his globally renowned Pure Trance concept for another beach edition at Beachclub Fuel, Bloemendaal. In two days the famous 3 day Trance madness will return on the most beautifull beach of Holland, bringing a little bit of magic from the Balearics to the Bloemendaal beach. Luminosity The Village now welcomes all festival visitor after a great day at the beach. Fun, pleasure and relaxation between the beach and the dunes. 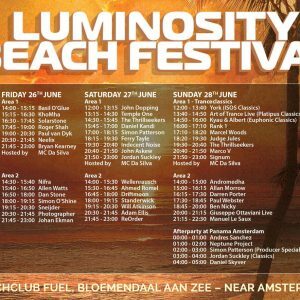 This is what awaits you at the Luminosity Beach Festival Village, one of the most beautiful resorts on the Dutch North sea coast.